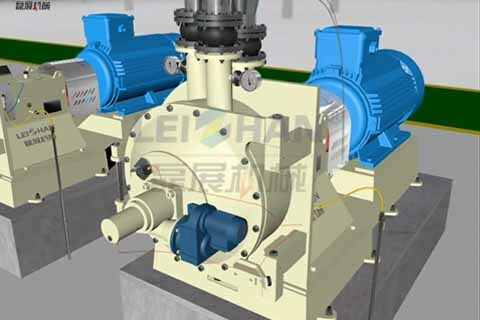 RF Series Double Disc Refiner is made by Leizhan company’s senior engineers to overcome technical difficulties, develop and research day and night. It has the characteristic of compact structure, small size, low power consumption, strong adaptability, easy operation, flexible adjustment, convenient maintenance etc. According to the process requirements, it can be used in single unit and multiple units in series or in parallel. ◉ Stainless Steel Shell. Excellent wear-resistance, long service life and low maintenance cost. ◉ Constant Power Control System. Continuous electricity supply ensure the stable beating effect. Reduce the following equipment burden, which improve the working efficiency of pulp making. ◉ RF Series Double Disc Refiner is not limited to one or the specific raw material. It is suitable for various raw materials, such as wood pulp, mechanical pulp, chemical pulp, waste paper pulp etc. The wide range of raw material meet the improving production demand of paper mills.